It's odd how the James Bond connection stays with some cars. The Aston Martin DB5, the Lotus Esprit and even cars like the Citroen 2CV all have the indelible stamp of 007 about them. 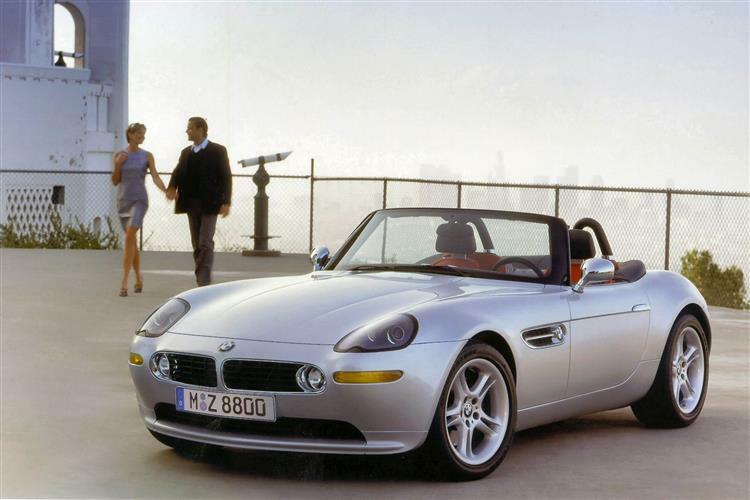 To this list we can add the BMW Z8, a car manufactured at BMW's specialist Dingolfing factory and which featured in 1999's 'The World Is Not Enough.' The car in the movie was a pre-production mock up which was just as well, as it got cut in half by a huge buzz saw. Were it a genuine Z8, one suspects the saw blade would have bent. This is one well-built car, a fact to which a handful of lucky owners will doubtless attest. As a used proposition it makes an interesting case for itself. BMW has a history of producing limited-run cars that delight the keen driver. The legendary 328 roadster made its debut in 1937 at the Nurburgring, whilst the elegant 507 - of which only 253 examples were ever built - was 1956's most wanted. 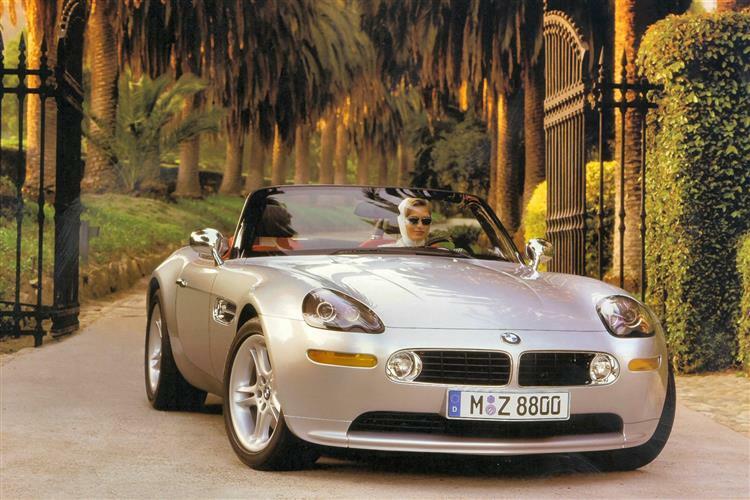 The M1 supercar and the Z1 roadster have subsequently tickled the palates of those who enjoy their BMW motoring served rare and the Z8 can be added to this list. First shown at the 1999 Frankfurt Motor Show, BMW's designers were asked to imagine that the 507 had never stopped production, the Z8 being the logical evolution of that design ethos. It seems that they succeeded. BMW 507 designer Count Albrecht Goetz paid the Z8 the ultimate compliment: "If I were to design the 507 today, it would look like the Z8." Retailing at £80,000 new, the Z8 isn't one for the masses, and resale values reflect its rarity. Given that it's uses many parts from the BMW M5 (a car that can do no wrong in the eyes of the automotive press) the Z8 received a distinctly cool reaction, many commentators feeling that the pretty styling didn't warrant a £25,000 price hike. Maybe they're right, but who can put a premium on beauty? The Z8 is a brute-force roadster with Fifties retro looks, boasts a hugely powerful V8 engine and enough high technology to keep the most exigent button-jabber happy. It's also rather rare and exclusive as only 8,000 will ever be built at the German Dingolfing plant. All are left hand drive and only a small percentage have ever reached these shores. The high list price has been a point for debate given that performance isn't really a great deal stronger than a Z3-based M Roadster, plus the steering wheel's in the wrong place - but then, this is a lot of car. Anyway, its rarity makes it an appealing alternative to cars like the Aston Martin's DB7 Vantage Volante and Mercedes-Benz SL55AMG. True, a Jaguar XKR Convertible or a Porsche 911 Cabrio would cost a fair bit less, but to be frank, both smack a little of mass-market next to a Z8. This is a car all about elegant design. The dashboard is a case in point. Like the exterior, it could have been lifted straight from the Fifties - though it's a lot nicer than anything they produced back then. There's a beautiful combination of soft leather, high quality plastic and lovely touches of aluminium, a metal used everywhere from the door handles to the indicator stalks, the steering wheel spokes to the ventilation switches. There's even more aluminium under the skin: virtually the entire structure of the car is crafted from the stuff, one reason why this open-topped roadster has the structural rigidity and therefore the crash safety of a coupe. The resulting lack of body flexing makes it feel a far more solid car than the smaller Z3. And it's a far better looking one. It's not perfect though. Even if you ignore the problems of the left hand drive set-up, there's lamentable fuel consumption (expect to average around 15mpg) further emphasised by the limitations of the tiny fuel tank. Then there's the small boot, the irritatingly fiddly clip-on tonneau cover and the less than ergonomic dashboard layout with its scattered switchgear. Despite the sleek looks, the Z8 is tougher than a two quid steak. The main thing you'll need to watch out for is crash damage, as the aluminium body panels are hugely expensive to replace should they become dented or creased in any way. The flipside to that is that rust is unlikely to be a problem! The engine is a hardy unit, despite its heady bhp per litre rating and is good for more miles than most Z8 owners will inflict upon it. Check the hood for signs of damage and check the Nappa leather seats for signs of brittleness or UV fading if they've been exposed to a lot of sunlight. Enthusiastic driving will betray a ravenous appetite for rear tyres. (based on a 2001 Z8, not including VAT!) A full exhaust system for the Z8 is pricey at £2,744 and things tend to go down hill from there. Front and rear brake pads are £70 and £53 respectively, you'll be looking at £382 for an alternator and £380 for a replacement headlight, £155 for a starter motor and £162 for a wing mirror. Can you say ouch? Since this roadster borrows its 400bhp 5.0-litre V8 engine from BMW's M5, one of the fastest four-doors money can buy, the fact that it's very rapid indeed shouldn't come as much of a shock. Sixty is a mere 4.7 seconds away from rest and, were it not limited to 155mph, the car would doubtless continue on towards 200mph territory. Mid range punch is even more astounding, the 50-75mph overtaking increment occupying a mere 4.3 seconds. Nor need you to be going quite this quickly for instant response. Over 85% of the power is accessible from just 1,500 revs. Absolute power then, which as we all know, can corrupt absolutely, or at least it would do were it not for the veritable forest of acronyms this BMW boasts after its name - DSC, EBD, ABS, CBC - and so it goes on. Most significant is DSC - or Dynamic Stability Control - which throttles back and selectively brakes each wheel should you chance to enter a corner too fast; a likely scenario for most owners within the first five miles one would have thought. Especially if they use the Sport button on the dash that remaps the electronic 'drive-by-wire' throttle for even sharper pedal response. Just the kind of thing Bond would appreciate in a tight spot. A few of the other clever hi-tech features might come in useful too. Take the sensors which monitor specially developed run-flat Bridgestone tyres, designed to travel up to 300 miles at 50mph without a breath of air inside. Other nice touches include neon brake and indicator lights that respond 10 times more quickly than normal, an electronic steering lock and standard satellite navigation so clever and compact that you hardly know it's built into the dashboard. 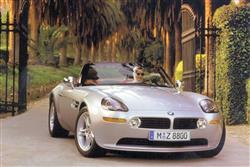 The BMW Z8 is a very specialised car, its left hand drive layout ruling it from many buyers' shortlists. If you don't mind cruising on the kerb side, the Z8 makes an intriguing used proposition. For about the price of a well-specified Porsche Boxster S you can instead buy a car that's genuinely exclusive and which packs the sort of punch that will see the Porsche disappearing in the rear view mirror. I'm sure James Bond would approve.